My recent post on rethinking macro-economics argued that monetary policy did all it could (and maybe was overstretched) during the weak recovery from the 2007-2008 crisis. The blame for the failure to achieve a robust recovery lies elsewhere, mainly with fiscal policy. The background for this failure is explored here; if there are any lessons to be learned from this experience, they don't seem to have influenced US President Donald Trump's current tax changes. 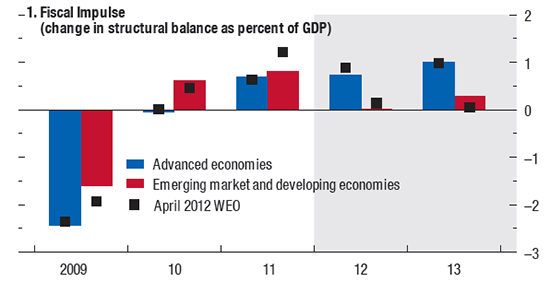 In April 2009, the G20 met in London and endorsed a multilateral fiscal policy stimulus. The financial crisis threatened a repeat of the 1930s Great Depression. Simultaneous stimulus meant that each country could be assured that its expenditures were not just leaking overseas, boosting foreign demand. This G20 decision probably represents the best example of international policy coordination since the Louvre/Plaza Agreements two decades earlier. Within a year, however, the thrust of macro-policy had reversed: fiscal policy went from expansion to contraction. 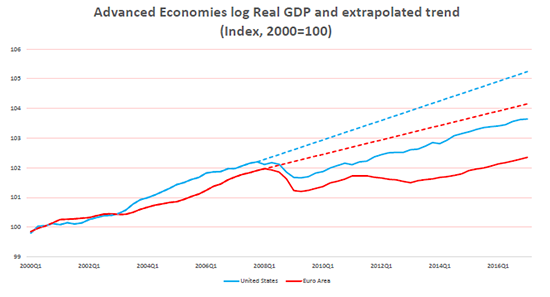 This sequence shows on the graph below as the expansionary 'fiscal impulse' of more than 2% of GDP for the advanced economies in 2009, succeeded by a contractionary impulse of around 1% of GDP in 2011, 2012 and 2013. The recovery, which looked to be on track in 2010 with 3% growth in advanced economies, fell to half that pace over the next three years. Why did the same policymakers who saw the need for substantial fiscal stimulus in 2009 reverse their stance so dramatically in subsequent years, despite the serious damage this seemed to do to the recovery? Explaining this policy about-turn serves to set out the controversies and confusions that have beset fiscal policy, still unresolved. The 2009 stimulus confirmed that traditional Keynesian-style fiscal stimulus works well. The recovery from the most serious crisis since the 1930s seemed to be well underway, despite headwinds from the still-unfinished repair of bank and corporate balance sheets. But government debt levels were clearly going to be pushed up if the stimulus continued. Meanwhile, the US political process was wrestling with the Congressional debt ceiling and impending debt cliff. Germans, never believers in Keynesian policies, led the push for fiscal austerity in Europe. By the end of 2009 the Greek debt disaster was unfolding. The specific problem of unsustainable debt in the European periphery was generalised into a concern about government debt everywhere. This alarmist climate allowed a range of pro-austerity voices to dominate the policy debate. Keynesian counter-cyclical policies had, in any case, gone out of fashion after the 1970s stagflation. The 2009 joint stimulus was an aberration, provoked by the enormity of the apparent danger. As soon as this passed, there was a ready acceptance of reversal and austerity. All main international financial institutions (the IMF, the OECD and the Bank for International Settlements) came out strongly in favour of austerity. As usual, the IMF explored a range of caveats, but its policy modelling and forecasts were based on a fiscal multiplier of around 0.5. This implied that the typical fiscal tightening of around 1% of GDP per year would take only 0.5% off a recovery, which in 2010 seemed to be going well, with the threat of another Great Depression averted. The first of these institutions to twig to the problem was the IMF, which was coming under criticism for consistent over-optimism about the pace of recovery. Tucked away at the back of the opening chapter the October 2012 World Economic Outlook was a text-box noting the close statistical correlation between under-forecasting of growth and the size of the budget contraction. This was followed early in 2013 by a more analytical piece co-authored by the IMF's chief economist Olivier Blanchard, which acknowledged that the implicit budget multiplier in earlier policy analysis had been unrealistically low. It might be true that in an economy operating at full capacity, fiscal action would be largely offset by automatic changes in interest rates and the exchange rate. But in an economy with ample spare capacity, interest rates already at the zero lower bound and widespread global weakness, neither lower interest rates nor a depreciated exchange rate could offset fiscal contraction. The piece from Blanchard said 1.5 would have been a better estimate than 0.5 (and that substantially higher multipliers might have operated), which would mean the typical 1% per year austerity was taking at least 1.5% off growth in each of the critical years from 2011 to 2013, followed by somewhat less in the next two years. The limp recovery should have been no surprise. At about the same time, some high-profile economists were suggesting that the government-debt concerns were, in any case, misplaced. Brad Delong and Larry Summers argued that the slow recovery had permanently reduced the economy's productive capacity. Unemployed workers lost skills and their connection with the labour force, so did not rejoin when the recovery occurred ('hysteresis'). Labour force participation figures support this view. This familiar graph illustrates the issue: the gap between the initial forecasts of potential output and the actual performance represents, in part, the 'long shadow' of hysteresis. With plausible parameters, Delong and Summers demonstrated that budget expenditure that facilitated a more rapid recovery would raise tax revenue enough to actually reduce government debt: a 'fiscal free lunch'. After three years of strong austerity, the budget contraction eased and the recovery has now picked up pace. Urgent concerns about government debt were hard to maintain when the period was characterised by historically low long-term bond rates. Common sense would suggest two lessons. First, the size of the fiscal multiplier depends on the state of the economy. Second, whether debt is a problem depends on what is done with the borrowed money. This common sense doesn't seem to be guiding current US fiscal policy. Trump has now persuaded Congress to agree to tax changes (mainly a reduction in company tax) that he promises will squeeze more GDP out of an economy already at full employment. Businesses, however, say their investment will be little changed: most of the tax saving will be returned to shareholders as dividends or share buybacks. By common agreement, income distribution will be worse and government debt significantly higher. Earlier concerns about rising government debt have disappeared. There is still enough disagreement and confusions about fiscal policy that an effective counter-argument was not mounted. We're still confused, but confused at a higher level.